 The guest house “La Vie Voyage” ensures through its partner Novaresa ( booking module provider ) optimal security measures against the loss, misuse and alteration of information entrusted to it by Internet users. In accordance with the laws governing the ownership of literary and artistic rights or other similar rights, all elements, marks, names, photographs, drawings, models, logos, graphics, color codes, etc. on this site are the exclusive property of the entities concerned of “La Vie Voyage” or its partners or suppliers, the latter or those granting no license, nor any other right than that to consult the site. The reproduction or use of all or part of these elements is only authorized for the sole purpose of information for personal and private use, any reproduction and any use of copies made for other purposes being expressly prohibited. Any other use is constitutive of counterfeit and sanctioned under the Intellectual Property, except prior authorization and written by “La Vie Voyage”. Hypertext links may link to other sites than this site. “La Vie Voyage” has no control over the contents of said sites and disclaims any liability in the event that this content violates the legal and regulatory provisions in force.